Standard Hydraulic Swing Gate Operators - Venture Mfg. Co. Solution Driven Hydraulic Swing Gate Operators Offered by Venture Mfg. 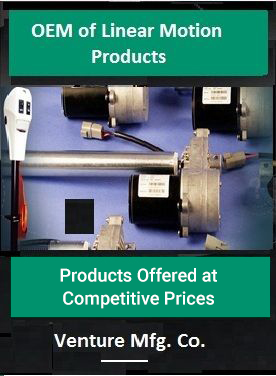 Co.
As a leading distributor for Byan Systems gate operators, Venture Mfg. Co. specializes in providing hydraulic swing gate operators. At Venture, we offer operators for heavy duty residential and commercial applications. These swing gate operators are self-contained systems, consisting of standard valve assemblies and hydraulic locks. This makes them capable of adjusting pressures to support heavy gates. The valve assemblies are designed to prevent the gates from drifting when opening or closing. The hydraulic locks help keep the gate in place when shut. All gate operator models are designed with 1/6 HP motors, which provide up to 220V of power. The hydraulic operator allows gates to move across 90 degrees within 18 seconds. The models can be used on gates up to 24 feet in length. They can work easily in hot and cold environments. As the systems are self-contained, the possibility of contamination from external debris, dirt, or fluids is eliminated. Once the operator has been installed, it requires no manual assistance. It is designed to automatically slow down the gate during opening and closing. The operator can be removed by simply disconnecting it from the line cord. Venture Mfg. Co. provides quality driven products, which can support the various needs of our customers. The Byan Systems hydraulic gate operators are ETL listed, and are available in a variety of colors. Contact us if you wish to know more about Byan Systems Products.